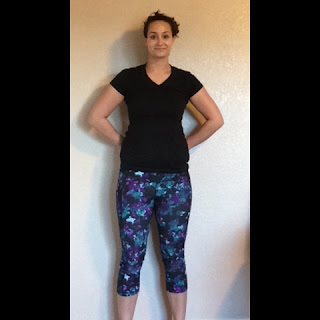 This #BEchallenge was so fun and SO HARD! I seriously thought I had it in the bag. I worked so hard. I tried to not take myself too seriously. I learned a ton about how I need to set goals & the best way for me to achieve them. About a week and a half out from the finish line I counted out my points and realized that even if I had perfect days for the rest of the month I still wouldn't reach my goal. Talk about depressing. I was shocked. I had worked so hard. I didn't even swear that much! That's a big deal, guys. Even Matt was surprised when I told him that I wouldn't reach my goal. Total bummer. Meal Plan. My meal plan was 2 points for each day. So if I missed that mark even a little bit... 2 whole points were gone. Occasionally I would give myself 1 point if I went over my calorie count, but I ate healthy all day. I was on fire with my meal plan and then a weekend would hit & I think "weekends are for food & fun!" Well that mentality hurt me bad. Morning Prayers. I really struggle to get up before Kess does, but I started getting up early to go to the gym before she woke up and before Matt had to be at work. I thought this would help with my prayers, but I was still in a rush every morning. Evening prayers are easy for me to say, morning is a constant struggle. Scripture reading. Like I said above, mornings are always rushed. And in the evenings I'm done. So tired. So I tried to read during Kess' naps... that didn't work either. So many excuses. At the end of it all I found some yummy, healthy meals, learned a ton about myself and lost 2 whopping pounds. Ok there is it! I decided to shorten my goal time to half of the month & then reassess for the 2nd half. The month long goal just didn't work for me, so I'm hoping shortening my goal time helps me stick to it! I'm hoping to make working out a priority, too! As much as I love working out with my little Kesser, it get's too tricky & my garage workouts were not helping me reach my goals. I've really loved going to the gym a few times a week before Kess wakes up. I'm much more motivated while at the gym, plus my day starts off with some "me time." I'm excited to work on the things that I struggled the most with last month. That's my goal really... to work on ME, to constantly be learning about myself, to always be growing. Thank you all for your encouragement last month! Here we go! Once again my Friday Favorites have turned into Monday Must Have... you would think my Friday would be the least busiest day of my week, but lo & behold - Fridays turn into crunch time. Lots of laundry, house cleaning & errands so we can enjoy our weekend together. 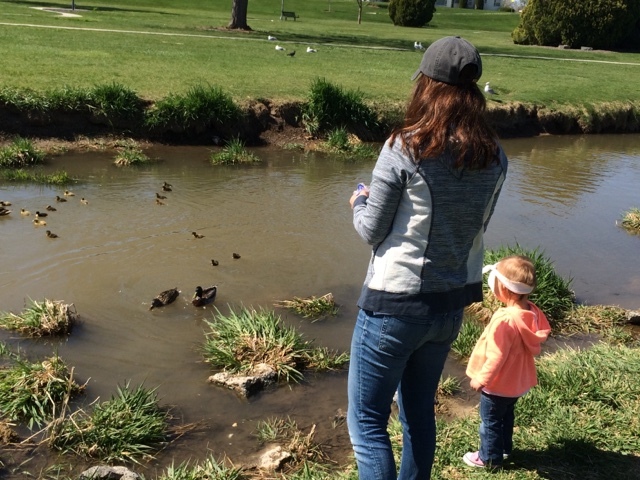 This weekend we got to feed the ducks & play at the park! It was so fun. Kess loved it, which means that we loved it. Hopefully this post finds you happy on a Monday! We are trying to get back into the swing of things over here! Here are a few things to brighten you Monday & start your week off right! 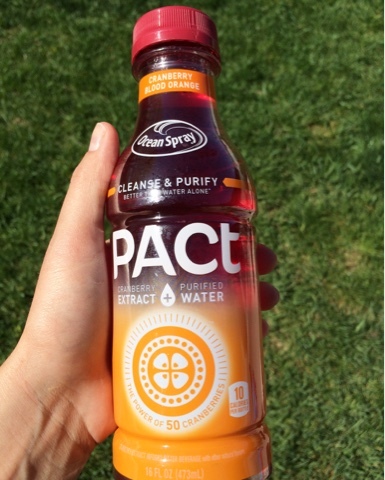 Ocean Spray PACT - Saw these are Winco & grabbed a few to try them. I will be going back today for like 25 more. No kidding. So good! All of the flavors are delicious! No green tea extract (I don't drink tea, unless it's herbal), no crappy sucralose or aspartame. 10 calories. You're so welcome. NuMe Wand - This is the wand I use to give my hair some beach waves. I use the 25mm & I love it! They're always on sale, too. Follow them on Instagram to get a heads up on deals! Thai Chicken Salad - Lunch time is one of the times I get to eat in peace. I savor it. Big time. I usually eat right after I put Kess down for a nap & right before I get my chores done. I've been trying to eat hearty yet healthy lunches! This one is beyond delicious and fulfilling. I tweaked the recipe a little to lower the calorie count, but that peanut sauce is to die for! Yum! Do you guys get in a rut with your clothes? I totally do. I find an outfit I feel half decent in & run with it. forever. I have a really neutral style. I rarely branch out (surprised?) On top of rarely trying a new style, the outfit needs to be cute, trendy, flattering, modest. Honestly, that can be really tricky. So, I've dug (deep) into my (tiny) closet and reached out to some of my favorite shops for this series. I'll be sharing with you some trendy, comfy and modest outfits, so if you're stuck in a clothing rut - maybe we can bust out of it together!! 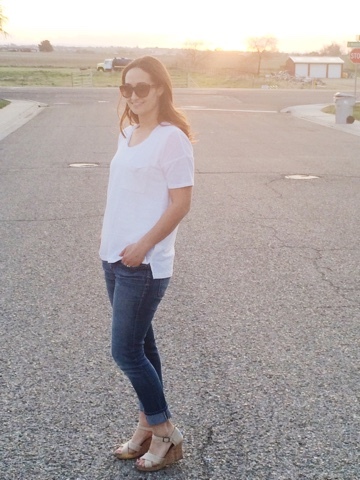 Today I'm sharing my go-to outfit. This is what I feel comfortable in. It's simple & can be dressed up or down. I think it's a classic look, but it gets a little less classic when it's all I wear! ;) Hence the new series! Ta da! I am in major love with boyfriend tees. Cute, comfy & flattering (covers up that momma belly of mine.) Whoever invented boyfriend tees should get an award. Or at least a hug! Old Navy has these cute linen boyfriend tees that are super light. They're inexpensive & come with multiple color options. And, of course - any good series needs a hashtag. Let's put it to a vote, shall we? Help a girl out & tell me your favorite! Stay tuned for some fun collaborations! Kess loves books. She loves to point things out, make noises & pretend read. Actually, it's one of the ways I can get her to settle down for a bum change. I hand her a book & tell her to read to me. Then I get to listen to her sweet jibber jabber. Love. Here are our current favorite. 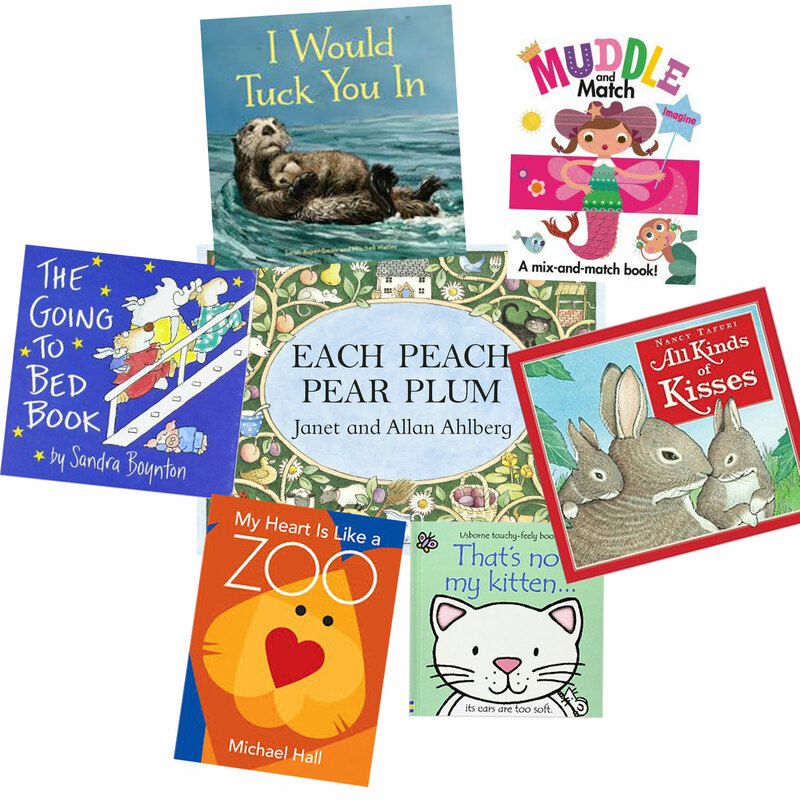 They are adorable, clever and most of all unto read for parent & child. - I tear up when I read this book. It's a sweet, mellow read for bedtime. -We have the "Imagine" copy of this & it keeps Kess occupied at church. You can flip through a series of split up pages (which Kess loves) to "muddle" the story or you can "match" the story. They're super cute! - This book is adorable, it talks about all sorts of kisses that animals give & Kess really loves the "woof kisses." - This book is so fun! It's a touchy-feely book. Kess really loves those & we actually have a few of these. "That's not my lamb, duck..." There is a whole super cute collection. Perfect for little babes who love different textures. -This is a super fun read, even for adults. It's energetic and clever. We make it a little song. -This is one of our newer faves. I can honestly say that we read it about 5+ times every night. It's darling. I really love reading it. -One of Kess' faves. This has a few nursery rhyme characters in it and their stories are all tied together. Super cute and Kess loves to point out the little characters and the rhyming is fun to sing along to. What are your favorite kids' books? We are always looking to add more to our collection! 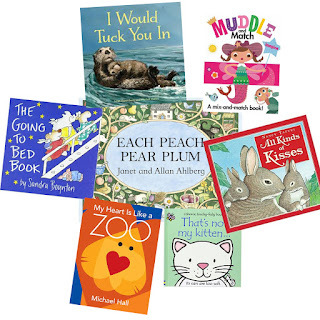 My friend Allie, of Usborne Books is doing a giveaway for you, my friends! Head on over to my Instagram (@beautifuleffort) for all the info! Also, Allie has a Facebook page full of great book info, new releases, promotions & deals. I ended up with 9 possible points for each day. 9 points x 30 days = 270 total possible points. My goal is to reach 250 points by the end of the month, because let's be honest... I'm human. I'm a mother, a wife & I work part time. This goal isn't to make me feel guilty for missing the occasional workout, or for letting a curse slip. The point of this goal is to strive to be a better person. To be aware of how I think, act & speak. To take better care of my body & to be conscience of what I eat. To be more aware of how I treat people & my thoughts toward them. I struggle with self-discipline & tend to justify my actions. This month is about changing for the better. I decided to take a "before" picture, mostly for myself, but every one loves a good "before" picture right? I know mine isn't the typical booty short & sports bra clad photo. The "after" shot won't be either. This may sound a little archaic, but I believe in modesty. I didn't always - like in high school & college. I kinda had the attitude of "if ya got it, flaunt it." Apparently, I thought I had it. A few years ago, that all changed. I had a desire to be a little classier and to strive for something more. For those who don't know me well, I am a member of the Church of Jesus Christ of Latter Day Saints. I had my sights set on getting sealed in the temple to my husband. I had decided that whenever we were meant to be sealed in the temple - I would be ready, my heart would be ready and my wardrobe would be ready. I didn't want to have my alter my whole lifestyle once we were sealed, so I started preparing. I threw out clothes that weren't garment appropriate. I had made a silent promise that I would dress appropriately so show that I was truly ready for that step. Now, there are times that it's obviously not appropriate to wear garments; swimming, showering, being intimate with your spouse. Not wearing garments when working out seems to be a toss up. I know members that do and members that don't. It's the wearer's decision. But, I personally believe that whether you decide to wear them or not, you should still be modest in your active attire. Lately I've seen popular bloggers seemingly sacrifice their convenants in the name of fashion and fitness. I won't be. But that's me. I, in no way shape or form am judging someone if they don't remain modest during a workout. Not at all. This is just what I believe & how I feel. I'm super excited for this challenge. I have a positive mind set, the motivation to change how I look, think, act & speak. Day 1 has started. Wish me luck!